This question and answer set is being provided to clarify some frequently asked questions regarding Respirators & Respiratory Protection at the University of Virginia. Does UVA have a Respiratory Protection Policy? 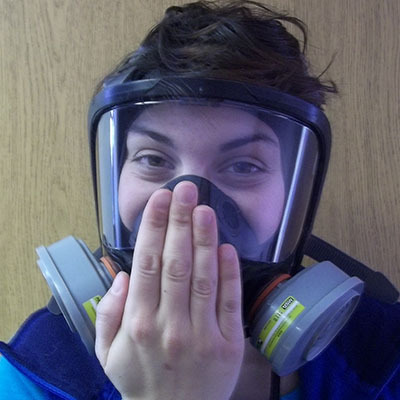 Are there special requirements to be met before an employee or student wears a respirator? 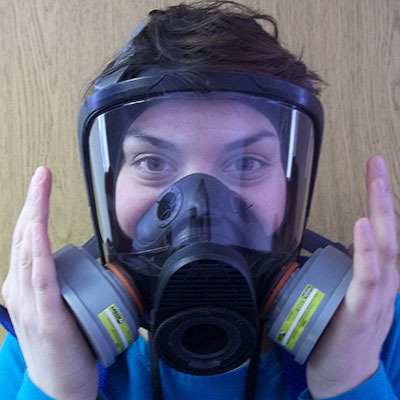 What are the special requirements to be met before an employee or student wears a respirator? How do I care for and clean my respirator? 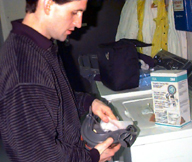 What do I need to do each time I wear my respirator to make sure that it is protecting me? When should I change the cartridges in my respirator? Where should I change the cartridges in my respirator? What respirator options are available if I have a beard or other facial hair? Federal Law (OSHA) requires employee protection from airborne hazards (like chemicals, dust or fibers) through engineering controls. If an airborne hazard assessment determines engineering controls are not feasible, respirators may be required to protect employees and students who are involved in these identified processes. 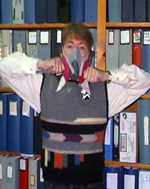 The correct respirator for the particular airborne contaminant(s) must be selected. Michelle Whitlock at maw4u@virginia.edu or 434-982-4836. Yes! UVA Controlling Hazardous Air Contaminants and Respiratory Protection Policy. UVA WorkMed must perform an initial Medical Evaluation to determine that the employee is medically qualified to wear a respirator. 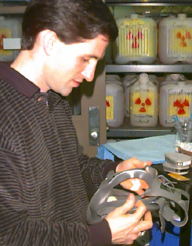 The Medical Evaluation must be done prior to assigning work tasks that require respiratory protection and are performed annually for the respirator user. Go to UVA WorkMed's website for: location, scheduling and medical questionnaire forms. Ask them when you make your appointment which form should be filled out prior to your visit. Non-compensated students assigned to respiratory protection, must report to Student Health for a Medical Evaluation to determine that the student is medically qualified to wear a respirator. Go to the Elson Student Health Center webpage for location and scheduling. The employee reports medical signs or symptoms that may affect his or her ability to wear the respirator. UVA WorkMed; EHS Respirator Program Administrator (RPA) or Industrial Hygienist; Department designated safety &health manager; or supervisor recommends a reevaluation. EHS RPA (or designated department safety & health manager), makes an observation during fit testing and determines a need. If any change in the workplace or tasks may substantially increase the physiological burden on the Respirator User such as: protective clothing, temperature or work effort. UVA WorkMed can advise on the frequency of performing periodic reviews of medical questionnaires and/or medical evaluations to identify any medical conditions. ANSI Standard Z88.6 –(latest revision) provides frequency guidelines based on the age of the individual (i.e. – every (2) years for individuals up to age 45 and annually after age 45). Respirators that require a facial seal (any part of the respirator that comes into contact with the face) will require the respirator user to be clean shaven. Facial hair includes any hair on the jawbone (e.g. beards including a day's growth, goatees and longer bushy mustaches). By law the new respirator user must be fitted for a proper respirator seal by a person qualified to perform a Qualitative Fit Test. The Respirator Program Administrator (RPA) at EHS performs Qualitative Fit Testing for UVA employees and students who are assigned respirators. The RPA can train designated individuals in a department to perform Qualitative fit testing, this is advantageous where there are multiple respirator users. EHS keeps documentation for employee and student participation in the UVA Respirator Program and notifies the designated individual in a department (.e. Lab Manger, Supervisor or Safety designee) when the User is due for annual Qualitative Fit Testing and respirator review. Employees and students who are assigned respirators to protect them from uncontrolled airborne contaminants must understand conditions when his/her respirator will not provide respiratory protection. Examples include but are not limited to the following: an oxygen deficient atmosphere or facial hair that interferes with the respirator seal. Recognize when or what airborne hazards could occur from work operations and workplace conditions. Determine the toxicity of the airborne contaminant. Properly wear the respirator and perform "fit checks". Inspect the respirator for satisfactory condition. Keep the respirator clean and to store it correctly. Wash in a warm soapy water bath with a soft sponge, then rinse it well with clean water– (i.e. ½ to 1 teaspoon of mild detergent such as Ivory in a dish pan filled 2/3's full). Respirator Cleaner solutions are available from respirator manufacturers and safety vendors. These may be convenient for multiple respirator users in a division or department. Contact EHS for information of available products and vendors. Let it air dry then store in a plastic bag to keep it clean. Do not crush your respirator by storing things on top of it. Always check your respirator to ensure it is in good condition before wearing it. Perform a positive pressure "fit check" - close off exhalation valve of the respirator and gently exhale, if no leak is detected in 10 seconds the fit check is O.K. Perform a negative pressure "fit check" - close off inlet opening(s) of respirator and inhale, if no leak is detected in 10 seconds the fit check is O.K. Do "fit checks" each time you don the respirator. Wear the correct respirator for the job including using the correct cartridge or filter. Always leave the work environment if you begin to taste/smell the chemicals. Always leave the work environment if you begin to have resistance in breathing. Always leave the work environment to change your cartridges in a clean, non-hazardous environment. Visual check to ensure good condition. Negative Pressure Fit Check for 3M Particulate Filters. Negative Pressure Fit Check for Standard Half Face or Full Face Respirators. 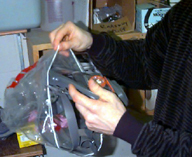 Positive Pressure Fit Check for Standard Half Face or Full Face Respirators. If you begin to taste/smell the chemicals. If you begin to have resistance in breathing. EHS can assist you in developing a schedule for replacement of your chemical cartridges. Any facial hair that interferes with the respirator's seal will prevent the respirator from functioning properly (i.e. the respirator user WILL NOT be protected from air contaminants). Respirator options for employees wearing beards or other interfering facial hair include using a respirator that operates in a positive pressure mode with a hood head piece. Positive pressure inside the hood will prevent leakage of airborne contaminants into the headpiece. The most versatile choice is the compact and portable Powered Air Purifying Respirator (PAPR), which can be seen below.